When someone says you can't do something...it makes you want to do it even more. That was the case when visiting the Muthaiga Club in Nairobi. They said no photos allowed. I got scolded for even taking this one shot. I couldn't resist. 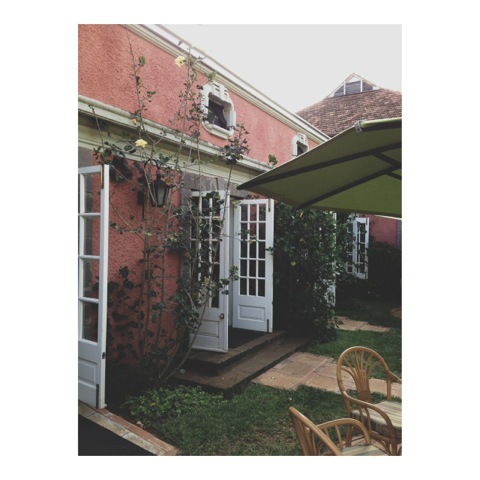 The color of the building, the climbing roses, the crisp white French doors, the outside seating under the umbrella. I hope you see why I had to break the rules! Horrid woman at Powis Castle grabbed my arm while taking a pic inside. Let her know the nuance too. She grabbed harder, I almost got kicked out. THANK YOU for getting the pic for us ! I am always getting caught doing the same thing! !